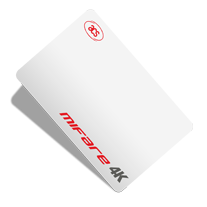 MIFARE interface platform consists of a few product lines, and the MIFARE 4k belongs to the MIFARE Classic family. The MIFARE 4k is fundamentally used for storing memories, yet a simple security mechanism divides the memories into segments. Therefore, this product family is ideal for high-volume transactions like transport ticketing, time and attendance solutions, car parking, and loyalty programs. Range of Operation: about 2.5" to 3.9"